Many users are easily confused by Outlook's contact options - you have Contacts, the Address Book and the auto-complete list. Add Outlook 2010's Suggested Contacts and there is a lot to be confused about. The address book contains a list of all Contacts who have electronic addresses (a Fax number is an electronic address). It's not a "real" folder or contact list, but a virtual view of all contact lists available to Outlook. I like to compare Outlook's Address Book to a shoe box or desk drawer where, in the past, we kept address books, business cards, and scraps of paper with addresses or phone numbers. The Outlook Address Book is a container that holds all your sources for addresses. Outlook Contacts folders and GAL (for Exchange users) are the address books, cards, and scraps of paper containing addresses stored within the drawer. Note: The top level listing "Outlook Address Book" is the container that holds all address lists (for many people, Contacts is the only list). When you select Outlook Address Book, it will say that there are No entries in this Address Book. This is expected, since it's just the "box" your other address lists are stored in. The Autocomplete list contains the addresses that come up when you begin typing in the To field. It's just a cache of recently used list of addresses. 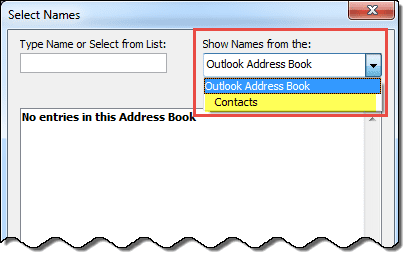 In older versions of Outlook, a lot of users stopped creating contacts and just used the auto-complete cache as their address book. Except the autocomplete list corrupted easily. Suggested Contacts was created for this group of people - they won't lose their addresses and the automatically saved addresses won't clutter up the "good" Contacts folder. When I start to enter a name in the To... field, I am offered several possible names and addresses starting with that letter in a pop-up under the field, that do not correspond to ALL the ones that start with that letter in the contacts cards. That is the auto-complete list offering names of people you recently replied to (well, the last 1000 people, so some might not be recent). You can disable this in options if you don't want to be offered any names. If you want to add all of your contacts to this list, open a new message and click To. Select all addresses and add them to the message. Close the message without sending and the addresses should come up when you start typing. If you want to see a list of the addresses in the autocomplete cache, or import them into Outlook Contacts, you'll need to use a utility. See Autocomplete Cache utilities for a list. 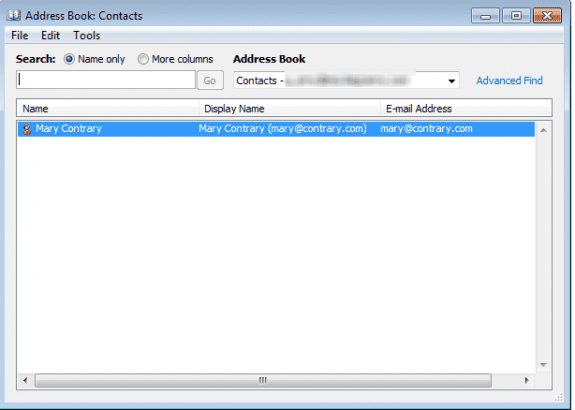 Suggested Contacts are contacts Outlook created for you and are email addresses only. This is a feature saves all addresses you send email to, automatically adding the addresses of people you send mail to, to the contacts folder. These are people you sent email to who are not in your contacts folder (or who Outlook couldn't find in your contacts - the look up is not very good and you may end up with duplicates). Note: Suggested Contacts is only in Outlook 2010. It was removed from Outlook 2013. When upgrading from Outlook 2010, the Suggested Contacts folder is left in the data file but Outlook will not add new contacts to it. You can delete the Suggested Contacts folder if desired. I have suddenly found in my Apple Mail product that it is creating contact cards for every single person I send or receive mail from - No name - just the email address. I have spoken with Apple and they suspect it is a Microsoft Exchange issue - Any thoughts? Is there a way for me to turn it off? Well, exchange will create entries in the autocomplete cache. What is the name of the folder these contacts are created in? Are you using Outlook desktop or Outlook on the web? You can turn off the autocomplete feature in Outlook but you may not be able to delete the folder. Hi Diane - I'm using Outlook 2016 on a Windows desktop. Do you know if it's possible to add Contact Groups to the list of Auto-Complete options? It seems to be only suggesting 'People'. We've tried emailing the Contact Group once but they don't appear in the Auto-Complete options after that. Thanks! Hmmm. groups should be in the autocomplete list (in either the new recent people or suggested people) if they are in your contacts folders, but it looks like only exchange server groups are. I will check on it. BTW, if you type enough of the group name to be unique, the name will auto resolve. Not quite autocomplete, not also not forced to pick from the address book. Apparently this is a bug - microsoft is aware of it and are working on it. Support repros this issue on version 1710.8625.2121 (I have 1711 and repro it too), but not on Build 8201.2200 and Build 8431.2107. If you really need this feature, roll back to either build. Diane, I send emails via outlook 2010 using vba. The user is on a company Office 365. I recently found that for one user that had multiple email addresses for a single contact the emails would fail with not resolved error. After tossing the extra email addresses in Contacts all are now able to send - except for one of them. That contact had the most email addresses of the group. I find that if I log in to Office 365, many of the old, removed email addresses are still visible; some show source as "contacts" and most don't show a source. Can you think of any way to clean up the addresses for this one person so that the emails won't fail? >> most don't show a source. if the contact card doesn't have a source, it is probably from the autocomplete list. If those 'bad' addresses come up when you type in the to field, delete them. I did delete the entry that was 'bad' that came up when typing in a name; it didn't change anything. After deleting from outlooks autocomplete, they still appear in Office 365, as email addresses for those People.I did that days ago, just couldn't include all of the things I'd tried. see if that address has contacts in the suggested contacts folder - delete them if found. What exactly is happening? The contacts are stored in the data file if you use pop; in a pst or ost with imap, and in the mailbox on the server with outlook.com. For a pst, you really just need to copy it from the old computer. Imap's 'this computer only' folders need to be exported. That is in Quick parts > autotext I believe. This is a known issue with some outlook.com accounts - they are working on it. Are you syncing with a phone? It seems to be more of a problem with android. Is there a way to link a company name to an email address so that when I type the company name in the "TO" field their email address auto populates? You would need to put it in the full name field.